I have a family with 3 young girls. Three young, messy girls. 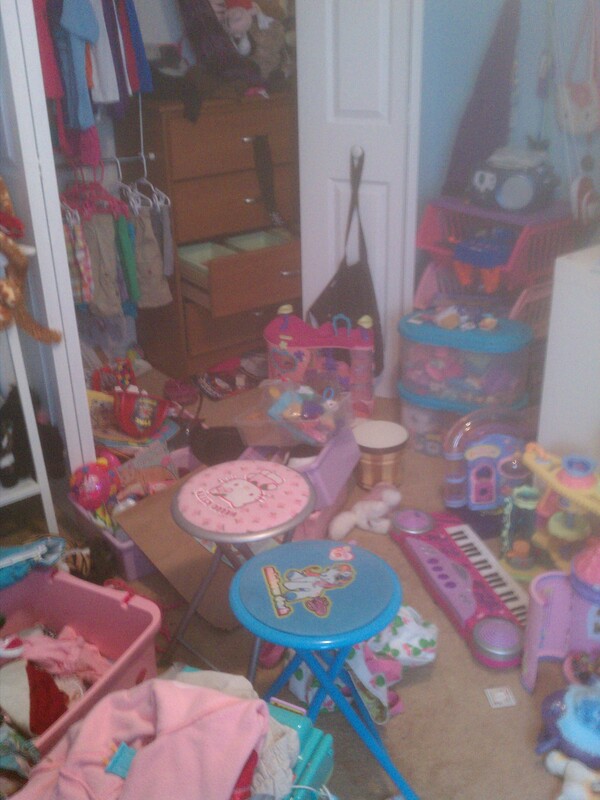 You may have messy little children in your home as well, and you may well be frustrated with the cluttered mess too. I’ve tried to teach them about putting like items together, and how this is beneficial. “See, now next time when you want to play with your Barbies you’ll know where all the pieces are!” It falls on deaf ears. I’ve tried helping them clean. I end up doing all the work while they dawdle and complain. I’ve tried punishment; the toys go into the “Saturday Box” and you’ll get them back on Saturday. Well, they have so many toys that they forget all about the ones in the “Saturday Box.” I’ve tried forced donations to Goodwill. They don’t care. Then, one day the idea just appeared in my head. Let’s group the toys by type, put them into labeled boxes, and have them check them out like library books! I am pleased to inform you that after one week, we just might have a winner. We have a clean bedroom; completely unheard of around here. I started by grouping all the toys by type, placing them into plastic bags in order to gauge the size of box I would need. The girls were actually quite helpful with this. Next, I went to my favorite store, IKEA, and chose some large, low-priced paperboard boxes. The product series is Kassett, and I bought a total of 12 boxes at $5 each (sold in packs of 2). 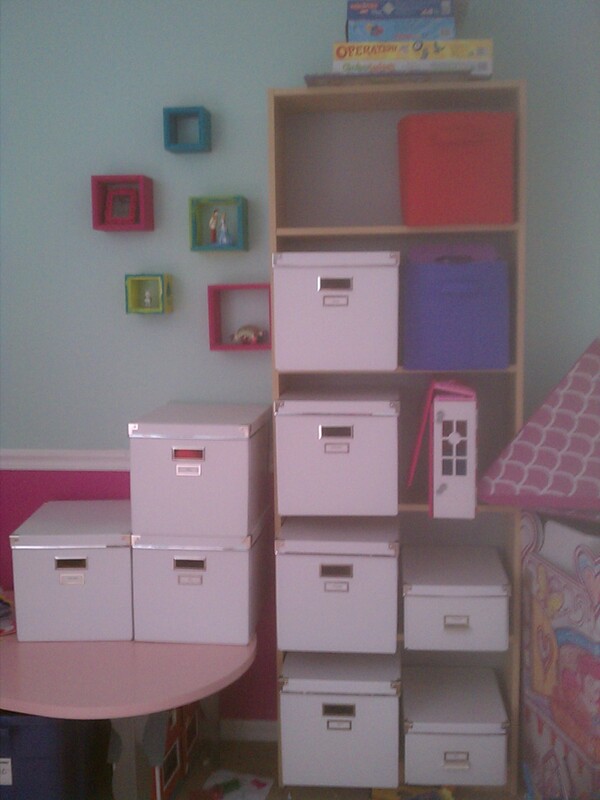 I also had a large bin I used for the Barbie stuff, since there was so much of it. And I already had the bin. Yes, the term “fire hazard” was lost on them. The girls were actually pretty receptive to the idea of “checking out” their toys. I think this may be because they were afraid I was going to throw the toys out, so anything besides that was wonderful in comparison. Whatever it takes to get them to buy in, I’ll take it. Next, I needed a way to track what was checked out and by whom. 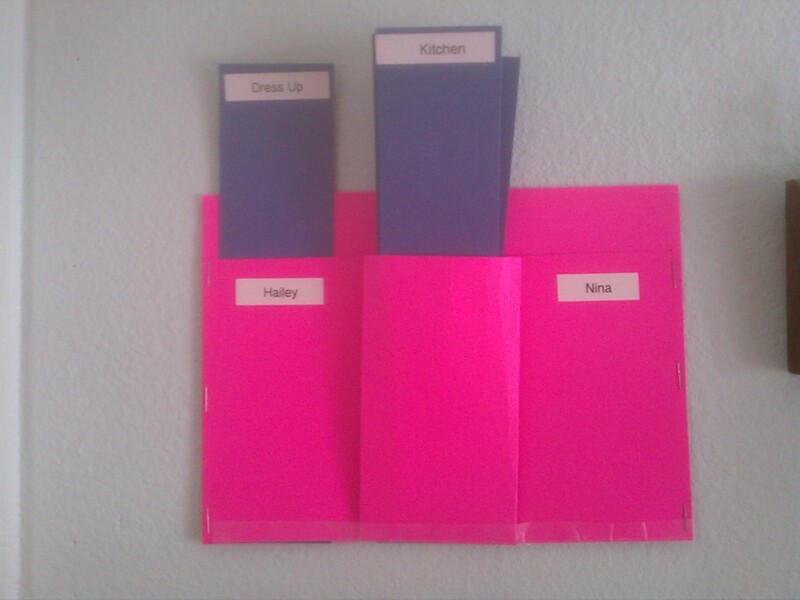 That’s when my neglected scrapbooking supplies came in handy. I fashioned the contraption pictured, and while it is far from an artistic masterpiece, it gets the job done. The deep middle pocket holds the cards with names of the corresponding boxes, and the 2 side pockets have the girls’ names. For example, Hailey has checked out the Dress-Up box. She will be responsible for its contents. If she would like to allow her sister to play with the items in the box, she remains responsible for their return to the box when they are done with them. This eliminates the “hey, who left this out?” line of questioning that inevitably ends in arguments and passing of the buck. So far, the girls have been compliant in not taking the boxes of toys without signing them out first. I think they actually enjoy having all their toys together. I’ve heard many exclamations of “I was looking for that!” which tells me they are buying into it. And of course, it is teaching them the value and benefits of being organized. Wow, that looks great! I wonder how I could use this idea for Legos. That’s about the only toy we have and we don’t keep sets separate (we sort by color). I will have to think; I’m going to IKEA tomorrow.